King John ruled England from 1199 to 1216. He had schemed to get power during the Crusade of his brother, Richard the Lionheart. John’s reign saw the Plantagenets lose much of the land that they had in France. Defeats to the French and subsequent, expensive, failures to regain these John becoming known as “Lackland”. The wars and the financial implications of them led to disputes with the barons. These led to the imposition of the Magna Carta in 1215. Despite these negatives, John’s reign did see administrative changes and laws that had a lasting positive impact on England. John’s rule was heavily criticised by chroniclers of the day and has been the subject of much debate by historians. John has received much criticism for his time as King. Indeed, from his adulthood onwards he has been painted as a schemer who was hard to like or trust. It is a view that has been revised somewhat, though there are serious flaws in his ability as a king. As Prince, John was one of 4 sons of Henry II who survived into adult life. The youngest, he was expected to inherit some land and to be an effective ruler of this as a Duke. As Henry II’s reign progressed, the issue of who would inherit what became an issue. John was earmarked Ireland, Aquitaine and Normandy at different stages of his father’s reign. Each of these brought with them problems, not least of which was that they had also been promised to other sons of Henry II at various points, and in many cases were still held by them. John had been granted lordship in Ireland. When he arrived the local Norman nobles and Irish chieftains came to pay homage to him. His retinue made fun of the Irish chieftains. However, John granted them land. This upset the local Norman settlers. John’s lifestyle and court whilst in Ireland was extravagant and expensive. In turn this led to taxation. The irish chieftains disliked this and united against John. The Norman settlers were still angered by their loss of land to the Irish. With no support and no monies raised from taxes to pay mercenaries, John had to return to England. Henry II replaced John as overlord of ireland. His first experience of rule was an abject failure. This contributed to John becoming something of a schemer. He grew close to King Louis of France and his son, the future Philip II. Together they participated in the great revolt of 1173, along with Henry the young King and Richard. The entitlements that John received as a result of the settlement did not please him for long. He was ambitious. When Richard set out on the Crusade he granted John lands in Mortain. He also banned John from entering England for three years, to prevent him from scheming. However, this decision was reversed and John capitalised upon it. He moved to undermine the appointed Regent. France became an ally in his plot. John acted and behaved as though he were the King. His plot with France was to make this a reality. The plot was foiled by his mother. The plot resurfaced when Richard was imprisoned. Again, it was the work of Eleanor of Aquitaine that prevented Richard from facing a usurper whilst in the captivity of the Holy Roman Emperor. John was using this as an opportunity to exert his authority: to the point where he offered the Holy Roman Emperor money to keep Richard imprisoned for a longer period of time. Richard left his lands to John. This meant that upon his accession, John was faced with problems. Richard had been fighting the French. Philip II had designs over the Vexin and Normandy, Richard had formed an alliance to repel them. While Richard led from the front, John did not. Richard had left the administrative aspects of government to trusted men and led the military campaigns. John did the opposite. He remained in England for much of the time. He worked on administrative changes and organisation. John’s position in Normandy was not helped by the fact that he was not the next in line to inherit if primogeniture was followed. Geoffrey, elder brother of John, had a son, Arthur of Brittany. If what we consider to be normal rules of inheritance had been followed it would have been Arthur, not John, who inherited. In Normandy, this is exactly what many of the nobles wanted and demanded. Richard’s nephew had a clear claim to the Norman and Angevin lands. John had to overcome this threat to his inheritance: remember that Richard had named John as heir. Arthur was only 12 at the time and in the French Court. Arthur spent time moving between the courts of Philip II and John. Eventually he took matters, even at his tender age, into his own hands. He led a force to lay siege to Château de Mirebeau in Normandy. John learnt of this and brought an army to relieve the forces of his mother who was in the castle. Arthur was captured and taken as a prisoner to Falaise. Arthur vanished from sight and records in 1203. His sister, his heir, remained imprisoned throughout the reign of John and that of Henry III. John’s hold on Normandy and the surrounding areas was weak. The clashes with France gradually took away the lands that he had inherited. By the end of his reign the English only had a pocket of land around Calais left on continental Europe. John did have some early victories, such as the one noted against Arthur’s forces. He is is criticised by some for having spent too much time away from the conflict. Issues in England kept him their and left others in charge of the defeats in Normandy. Far from this passing the blame to those nobles, it was seen as a sign of weakness. In England John faced problems with the barons and the Church. The Barons were disgruntled by the levies of tax. They then saw their lands in Normandy being lost, costing them revenue and status. These issues were ongoing. John raised scutage levies on 11 occasions. This is a tax to be paid in lieu of military service. In several cases, there was no general call to arms, so scutage ought, traditionally, not to have been levied. John also sold off lands and titles. He introduced taxes on inheritance; taxed widows who wished to remain single; sold charters for new towns. John also stepped up the introduction of Sheriffs. Sheriffs could buy the right to have the title. They then recouped the money through taxation and imposing fines. Sheriffs at this time found that they could extract much from small communities who lived in forests. This is possibly where the legend of Robin Hood comes from. In 1210 John imposed Tallage. This is a tax specifically on Money Lenders, all of whom were Jewish. The Money Lenders had little choice to pay. The method they used was to force repayment by those who had borrowed. This put many English nobles in a financially precarious position. John also realised that some barons could not or would not pay tax. So, he introduced a tax on the movement of goods. Essentially this was a duty on goods similar to that which is paid on imports and exports today. The measures in themselves are extremely good ways of ensuring a regular income for the crown. The method of implementation and the close proximity of them all led to discontent. The combination of problems led to conflict with the barons. A baronial war led to terms being agreed that would keep the crown in check. They are enshrined in Magna Carta, a document that prescribes the relationship between the monarch and the barons. Magna Carta, for all of it’s symbolic significance, was largely ignored by both john and the Barons in the short time between it being forced upon John and his death the following year: it did become more significant later with reissues under Henry III. In 1205 the Archbishop Of Canterbury died. Choosing a replacement was a matter that had previously been the cause of much distress. 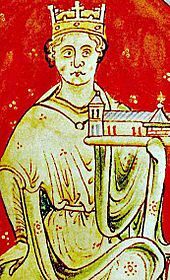 However by the end of Norman rule a reasonably established system had been in place that balanced out the authority of the church and king. In 1205, this did not happen. The clergy of Canterbury secretly elected one man. King John had chosen another. The bishops of England also said that it was their right to decide. The chapter sent their man, Reginald, to Rome to be confirmed by the pope. The bishops told the chapter that they disagreed. John intervened and forced them to change their minds. Messengers were sent hurriedly to Rome. Pope Innocent III was a great believer in the right of the church to make ecclesiastical issues. He didn’t want interference from a King. Innocent decided to anoint his own candidate as Archbishop of Canterbury, a right he had under church law. He appointed Stephen Langton and informed John. John was incensed and refused to allow Langton enter the country. He took control of the archbishops lands and some papal properties. Negotiations failed. In 1208, Innocent responded by placing England under and Interdict. This banned religious services. The only things the clergy were allowed to do were baptisms and the hearing of confessions of the dying. John responded by seizing more property. Innocent in turn excommunicated John. England went through this period of no official services, though it is thought the rules were bent, until 1213. John then signed the Golden Bull agreement which accepted Langton, saw services resumed and recompensed the church for their losses. After this, Innocent became a firm supporter of John, even though the compensation was never paid in full.